The Acquisition Directorate is reporting that they have issued a draft Request for Proposal (RFP) for a new contract to build Webber class WPCs. It will provide for options of either four or six cutters per year for seven years. If all options were exercised the maximum number of cutters that could be built would total 42, but this probably will not be the case. 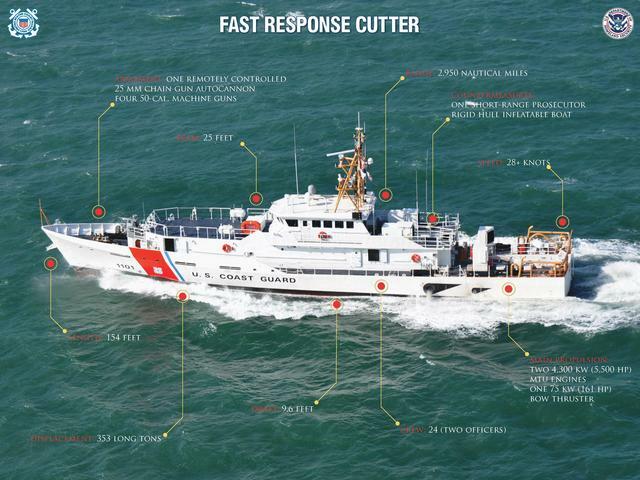 In February 2012, the Coast Guard exercised a $27.2M option to purchase the “Procurement and Data License Package” for the Webber class Fast Response Cutters, so the Coast Guard can allow other shipyards to bid to build follow-on ships of the same class. 25 September 2013, the Coast Guard exercised an option for six more cutters. This resulted in a total 24 Webber class built or under contract. I believe this was FY2013 money and we will see another contract to exercise the final option on the existing contract bringing the total to 30, which leads to a question. There is a statement in the RFP that I find difficult to understand, B.2. (b) “The total number of cutters obtained under this contract will be limited to twenty-six (26).” All along the program of record has been 58 of these vessels. The maximum number of vessels that can be funded under the phase one contract is 30 cutters so why limit this second contract to 26 when we have a stated requirement for 28 more? Does the Coast Guard plan on making a sole source buy of two ships in FY2015 and award this contract in FY2016? Why preemptively limit the buy to less than the total of the options anyway. There might be a change of plans that would increase the Coast Guard requirement. The Navy might want to buy some using our existing contract, or the Coast Guard might want to make a Foreign Military Sale purchase on behalf of a friendly foreign government. Despite being probably the best candidate we will ever see (a mature program with a proven product, approved by the Department for full rate production, that will continue for at least another five years), I saw no indication that a multi-year procurement was considered. I would hope that savvy ship builders would offer this as an additional option. It is still not too late for the Coast Guard to obtain Congressional permission to award a Multi-year Procurement for these ships. Or for Congress to direct this money saving procurement method.